Bonjour, friends! 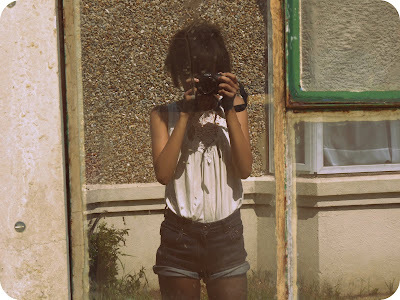 This is just a super quick post to show you all what I'm wearing, I shall probably do a bigger and better post tomorrow. Right now my mum and I are staying at my auntie and uncle's house in sunny Bournemouth, so today I have just been playing with my two gorgeous little cousins, Kyron and Jacob. Anyway, more on that tomorrow, hopefully we'll be going to the beach! The H&M top was fifty pence in my local charity shop, I just adore the crochet detail as it shows a lot of bust, but in a lovely demure way. Once again I'm just wearing my usual cut off shorts and polka dot tights. Though, for most of the day I actually had my legs out, like completely, cor blimey! Let's hope that soon I will be able to be comfortable enough to venture out with no tights not just in a garden in Bournemouth, but in the streets of London! Thank-you for all of your kind comments, I really am in a good place at the moment. Love, Jazzabelle. You look gorgeous & m'love, it's far too hot for tights! If you can rock those shorts with tights on, you can certainly do it without! I wouldn't be able to get even one leg into them, so flaunt what you've got! Good to hear that you're well. Cute outfit, and I'm loving the feel of these photos. Have fun at the beach! What lovely sunny photos! That top was a steal, it looks gorgeous with those shorts. The beach? Total envy, I haven't seen the sea for ages. love your outfit girl! I love how you chose to take your picture! it gives it a vintage feel. thank-you for all of your kind comments! Isn't the weather delightful? I'm quiet surprised by it, but I hope you're soaking in plenty of vitamin D! Your luck in charity shops is amazing, I'm quiet sure you have a super power! I hope you have a lovely summer dear, and keep on blogging, your posts are always a joy to read! I love the feel of these photos, the green frames add a lovely touch! SO gorgeous - i'm dying to see that exhibition - so jealous! I love your photography and your knack for finding things in charity shops!